The Africa Forest Communicators Networks are voluntary partnerships of forestry communication officers from both private and public sector organizations in English-speaking and French-speaking African countries. The networks strengthen forest communication capacity by sharing solutions and best practice techniques to address forestry issues and challenges in the region. The Francophone-African Communicators Network was established in October 2013. Nine communication and forestry officers from Benin, Côte d'Ivoire, Niger, Togo, Burundi, Gabon, Senegal, Madagascar, Central African Republic and the Democratic Republic of the Congo signed a resolution creating the network and agreed on the concrete steps to create the tools necessary for the network's future activities. 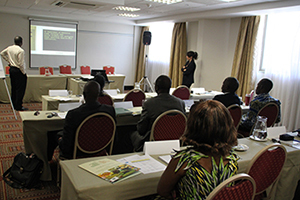 A representative of the communicators network reported on the outcomes of the workshop at the biennial meeting of the African Forestry Wildlife Commission in October at Windhoek, Namibia. 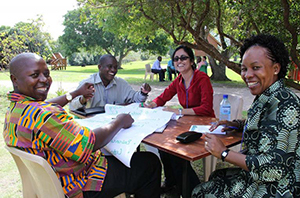 The Anglophone-African network members are drawn from Tanzania, Kenya, Uganda, Rwanda, Ethiopia, Mozambique, Malawi, Zambia, Zimbabwe, and South Africa. Country participants met in Bagamoyo, Tanzania from June 26-28, 2012 to discuss issues on forestry communication in the eastern and southern region of Africa. The main aims of this workshop were to develop and strengthen forestry communications capacity in the region and to explore the possibility of establishing a self-sustaining sub-regional network of communication practitioners.